The 16 oz. BlueDevil Pour-N-Go Head Gasket Sealer is formulated for the Do-it-Yourself customer who has limited time, or is not mechanically inclined. The 32 oz. is the viable source for customers with larger cooling capacities, severe cooling system leaks, or garages that want two applications out of one bottle. The 16 oz. is intended for the customer seeking a single repair on a 4 or 6 cylinder engine. The ease of use, along with the savings in cost, make the 16 oz. BlueDevil Pour-N-Go an excellent retail option. To diagnose your potential leaks, be sure to read our post on blown head gasket symptoms. For More Information, Please Visit: BlueDevil Products: Pour-N-Go! I have a 2002 Ford f 150 and my radiator is loosing all fluid by the head gasket. Im not too mechanically inclined but I do know a little bit. I don’t have a direct cap to my radiator, everything goes thru the reservoir. How do I apply your product to fix my truck. I have heard many great things about it and want to try and save my baby! If your vehicle has a reservoir rather than a radiator cap, instead of pouring it through the reservoir, with the car off and engine cold, you may add the product through the top radiator hose. Once it has been added reconnect the hose and start the idle from that point. I have failed to keep the idle going so did not have enough time. I also have a F150 with no radiator cap and did the slow pour into the reservoir which is pressurized 16 lbs. – but only after the cap is back on the reservoir I presume. If I try again by pouring it into the disconnected top hose, do I still pour it slowly or just add it all and reconnect? If your vehicle only has a reservoir/overflow rather than a radiator cap, instead of pouring BlueDevil through the reservoir/overflow, with the car off and engine cold you should disconnect the top radiator hose and add the product there. Once it has been added reconnect the hose and start the idle from that point. Will this product work on a 2006 Ford F250 super duty 6.0 Diesel V8 turbo?? I know it would take 32oz of this product if it will work. Thank you for asking about your Ford F-250. It appears the cooling system capacity in your vehicle is 27.5 quarts, approximately, 7 gallons. For a system of that size, you would want to use about 64 oz. of the product, or 4 of the 16 oz. BlueDevil Pour-N-Go Head Gasket Sealers. I’m about to use the Blue Devil pour n go Head gasket sealer. I have faith in this product because I have already used the Blue Devil radiator flush and block sealer about a year ago and it’s still holding. I have a 2002 monte carlo and i wanted to know if I dont flush the system or remove the thermastat will it still work? If you are using BlueDevil Pour N Go Head Gasket Sealer (http://store.gobdp.com/pour-n-go-head-gasket-sealer-00209/) you will not need to flush the system or remove the thermostat prior to use. This is a less concentrated formula that is made to be “easy-to-use”. The larger 32 ounce BlueDevil Head Gasket Sealer (http://store.gobdp.com/head-gasket-sealer-38386/) is the product with the additional directions of removing thermostat and flushing the cooling system. Feel free to contact our tech support team at 888-863-0426 with any further questions. My vehicle needs the coolant refilled once a week (about 1/3 of a container of coolant). I let my reservoir go super low so that i could pour 32 oz (two of the 16 oz). I let my vehicle cool and removed the radiator cap. I turned the vehicle on and put my heater on full blast. I then tried to pour the blue devil pour n go (16 oz) into the radiator and it just settled/pooled and did not accept more than 1-2 oz. Any idea why that would happen?? Were you getting combustion/exhaust gases blowing into the cooling system and creating pressure? Please contact our technical support line at 888-863-0426 so that we can get a better understanding of the vehicle’s condition and be able to make any appropriate recommendations. Do I flush my oil out before or after? If you have water/coolant in your oil, we recommend changing the oil before and after the BlueDevil process. Feel free to contact our technical support line at 888-863-0426 with any other questions. The product should be poured in through the radiator cap. If the vehicle does not have a radiator cap, with the vehicle off and engine cold, you can remove the upper radiator hose, pour the product in through there, reconnect the hose and start the idle from that point. Hello i my car was running hot a few weeks ago and i would hear bubbling when i shut the engine off, only to discover i had a crack in my head gasket. My mechanic introduced me to blue devil and so far it has not ran hot but recently sometimes when i shut the engine off i still hear a little bubbling. That is excellent to hear! The system should be bled to get rid of any potential air pockets in the cooling system. You can do this by simply draining and refilling the system. Feel free to contact our technical support line at 888-863-0426 with any other questions. Can I add the sealant through the resovoir or does it have to go to the radiator directly? Thank you in advance. After adding the sealant and letting it idle , losing some coolant in overflow is this normal. If your vehicle only has a reservoir/overflow rather than a radiator cap, instead of pouring it through the reservoir/overflow, with the car off and engine cold you should disconnect the top radiator hose and add the product there (it may be added into the hose or through the opening). The speed of the pour will not make any difference as the engine will be off. Once it has been added reconnect the hose and start the idle from that point. DO NOT pour the product in through your reservoir. As per the directions, you are adding the product when the engine is cold. Pouring the product in through a reservoir/overflow tank would essentially be like adding the product when the engine is hot, which would greatly limit the effectiveness of the product. Feel free to contact our technical support line at 888-863-0426 with any other questions. Based on your description, you should change your oil before and after using the BlueDevil Pour-N-Go Head Gasket Sealer. Feel free to contact our technical support line at 888-863-0426 with any other questions. Thank you for asking about your Dodge Charger. If your vehicle only has a reservoir/overflow rather than a radiator cap, instead of pouring BlueDevil through the reservoir/overflow, with the car off and engine cold you should disconnect the top radiator hose and add the product there; do not pour it into the reservoir. It may be added into the hose or the opening on the radiator. Once BlueDevil has been added, reconnect the hose and start the idle from that point. Leaving the thermostat out will only be an issue if you are worried about getting heat. If you live in a warmer climate, you probably wouldn’t need to put it back in. I have a slow antifreeze leak from what I was told is a blown head gasket. The mechanic told me it would be $1399.00 to have it repair so it is a 2007 Toyota Camry with 190k miles I thought I would try it. Now before I have done anything the oil change guy said never put anything in the radiator because it will clog the heater core and start many problems with the engine. What is the the truth ? We have not had issues with our product restricting flow in any portion of the cooling system, including the heater core. We do recommend using BlueDevil Head Gasket Sealer (http://store.gobdp.com/head-gasket-sealer-38386/) to help repair the blown head gasket in your Camry. Feel free to contact us at 888-863-0426 with any questions. 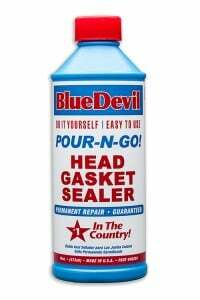 The BlueDevil Pour-N-Go Head Gasket Sealer would be poured in through your radiator cap. Feel free to contact our technical support line at 888-863-0426 with any other questions. What happens if my car won’t keep a 50 min idle.. . ? If the vehicle is unable to idle for the full 50 minutes without overheating or stalling out, unfortunately, the leak you have or the symptoms you’re having may be a little too extreme for the product. A hard part repair may be your best option. The BlueDevil Pour-N-Go Head Gasket Sealer is intended for use in 4 or 6 cylinder engines and is able to be used in V-8, however, it would not be enough product to properly treat the system. Typically, you would need at least two bottles to properly treat that size of a system. Feel free to contact our technical support line at 888-863-0426 with any questions. Thank you for asking about your Cadillac Deville. If you used the Pour-N-Go Head Gasket Sealer, you may have noticed on the back of the bottle that it is intended for use in 4 or 6 cylinder engines, so it would not have been enough product to properly treat your V-8 NorthStar engine. Please contact our technical support line at 888-863-0426 so that we can get a little better understanding of your product application and be able to better assist you. I used the pour n go version of the Blue Devil on my 97 Deville. The white smoke disappeared and the car ran as smoooth as ever. I did this back in March, but the white smoke seems to be returning. Can I use this again? I had the oil changed right away after the first treatment. I haven’t tried the big bottle because I don’t want to mess with removing the thermostat and draining the cooling system. Do you think I should take that route this time? Is it the better way to go? Yes, you can definitely use BlueDevil a second time… Due to the amount of time that has passed since the first treatment this may be a new leak. The 32 oz. mechanic approved version will give you the best overall results as long as you are able to follow that set of directions. However, if it’s difficult or you are unable to remove the thermostat, we recommend using the Pour-N-Go again. We would recommend using half (16 ounces) of the BlueDevil Head Gasket Sealer with a yellow label (part #38386). You will want to thoroughly flush the cooling system to help remove any rust, deposits, and/or dirtiness from the cooling system prior to use. In addition to the directions you will want to also change your oil before and after the BlueDevil process to ensure proper results. Feel free to contact us at 888.863.0426 with any further questions. 1985 CHevy 350. Guess the head gasket blew. Heavy white smoke. Shut it off and one cyl was HYDROLOCKED by water. Had to pull plug and water spewed out. Also had water in oil but not a lot–I drained the oil and radiator and its been sitting a year. Question is, I can fill the oil up and water and get it started but if its spewing water into the cyl and oil too fast, and I have to idle for 50 minutes, wont I be flushing so much water that your product wont keep and also take a chance of killing my bearings? Unfortunately, it sounds like your vehicle has gotten to a point where it is leaking too quickly and would not give BlueDevil enough time in the system to work properly. Based on your description the vehicle would have a lot of trouble idling for a 50 minute period. We would recommend going with the hard part repair in this case. My 97 blazers oil pressure sensor went out causing me to spring a leak but I didn’t allow it to run low! I got it home and replaces sensor and pulled drain plug on oil pan. When i twisted oil filter off i noticed the swirl look of mixed coolant. When i cranked it ran for only 2 seconds and it died after slight backfire. When i got it idling again it sounds weak and has slight popping. It almost sounds lime an exhaust leak. Is it too late to use Blue Devil? You should change your oil before running the engine anymore. In order to use BlueDevil your vehicle will need to be able to maintain an idle for 50 minutes without stalling out or overheating. If it can do so you will have a good chance at sealing the leak using the BlueDevil Head Gasket Sealer. I have used the pour n go and the white smoke has stopped but there is still a drip coming out the tail pipe. Should i apply again or will this stop in a day or two? Please contact tech support at 1.888.863.0426 so we can help diagnose your situation! hi my truck is a 03 dodge ram but its an 8 cyl engine not 4 or 6.will this work on my engine? I am not mechanically inclined and realized after application and 50 min idling that I poured this product in the reservoir instead of the radiator. How should I proceed? I was rushing to use the product i didnt drain it or remove the thermostat but my exhaust smoke stop in my heat came out for 30 seconds should i let it sit overnight in check it tomorrow n replace my thermostat ? Yes, we recommend testing the vehicle after the engine has cooled down completely. The reason that we recommend the thermostat is removed is to ensure the cooling system is free flowing with BlueDevil in the system. You should not have to replace your thermostat even though it was left in for the initial idle with BlueDevil Head Gasket Sealer. I would recommend calling our technical support line so we can diagnose your problem a little further. It sounds like our commercial grade 32oz. may be a better option for your situation. Please call 1.888.863.0426.
hello well today i decided to try the “Blue Devil pour-and- go” because i started noticing a lot of smoke after driving my 1998 honda civic. In my situation before installing Blue Devil smoke was not coming out . but now after the treatment it comes out more than before . i followed the instructions pretty well. my car actually stopped from overheating . but will the smoke eventually stop as well ? It can take a day or two for the moisture to completely clear out of your exhaust system. If it persists after 2 – 3 days then contact us at 888-863-0426 and we would be happy to assist you further. I used the pour n go, and I had so much air in system that it dumped coolant in the oil pan. So I’m sure your product didn’t get much of a chance to run through the system and is now in oil pan. What should I do? I spent 40 bucks, followed your directions, and now I’m out 40 bucks and my car is still not fixed. Is there any possible way you could give me another pour n go bottle with directions that will fix my leak? I am unemployed and can’t afford another bottle of pour and go. I would appreciate it if you could do something for me in these troubled times. Thank you, and I look forward to hearing from you! I have some water in my oil. I bought a bottle of your pour-n-go. Do i change the oil and filter before i use the pour-n-go? And do i do it again after? Please help. 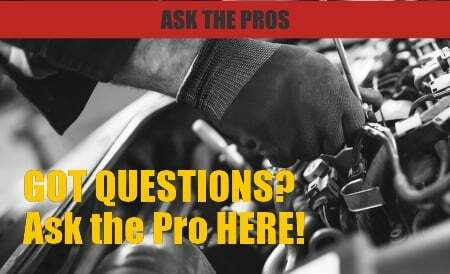 Yes, you will need to change the oil before and after the BlueDevil process. I have a ford mustang with a 3.8 coolant is getting into the oil and white vapor smoke is coming out of tail pipe. will the blue devil work for that? Darrell, based on the symptoms you have described, your Mustang would be a great candidate for using BlueDevil Head Gasket Sealer. Feel free to contact our tech support team at 1.888.863.0426. Very confused. 2000 Ford Explorer 4.0 V6 OHV. I had a head gasket leak causing a rough idle/misfire and bubbling coolant reservoir but no smoke. I used blue devil after flushing the system twice with Prestone flush and followed the directions to a tee. Rough idle and misfire has ceased, but now there is thick smell of burning coolant and exhaust is smoking now like typical blown head gasket… I guess one step forward and two backwards… Will this resolve after a little while? Please give our tech line a call at 1.888.863.0426 so we can discuss in detail. Above idle my Jeep Commander overheats. To eliminate the possibility of a warped head, I removed the top hose and added “Pour-N-Go” per directions on bottle. The temperture gauge stayed 3/4 toward hot during the 50 minute idle period. After that, with transmission still in park, I reved the engine to 2,500 – 3,000 RPM. The gauge quickly pegged all the way to hot. I do have a small radiator leak, but I made sure anti-freeze level didn’t get low. Would that leak prevent the Blue Devil from working, or is something besides a head problem causing my overheating? Based on your description the product has not worked. It sounds like you may have multiple issues going on with the cooling system that would be difficult to diagnose without actually seeing the vehicle. Please contact us at 888.863.0426 so that we may assist you with the warranty process. You may want to have the vehicle diagnosed by a professional to ensure that you actually have a head gasket leak/problem. If it turns out that you do have a slight head gasket leak then it would be appropriate to add BlueDevil. Yes, you would need to use two bottles of the “Pour N Go” to treat your V-8 Dodge. In addition to the directions, you will want to change the oil before and after the BlueDevil process. Instead of pouring the product through the reservoir/overflow, with the car off and engine cold, you may add the product through the top radiator hose. Once it has been added reconnect the hose and start the idle from that point. Feel free to contact us at 1.888.863.0426 with any further questions. Yes, the BlueDevil “Pour N Go” Head Gasket Sealer will work for you. Based on your symptoms you will want to change your oil before and after the BlueDevil process to ensure proper results. Feel free to contact us at 888.863.0426 with any questions. Hi i have 99′ GMC YUKON I WAS TOLD I HAVE A BLOWN HEAD GASKET……I HAVE READ THE DIRECTIONS ,, AND FOR THE RADIATOR FLUSH ….DO I DISCONNECT THE END OF THE HOSE THATS CONNECTED TO THE RADIATOR….OR THE END THATS ON THE MOTOR? ?,,, AND IVE SEEN OTHER COMMENTS CONCERNING CHANGING THE MOTOR OIL …..IS THIS ALSO PART OF THE PROCEDURE ?? You may add the flush directly through the radiator cap, if your vehicle has one. If the vehicle only has a reservoir, then you may add the flush the the top radiator hose (where it connects to the radiator). If you notice any milkiness or signs of water/antifreeze in your motor oil then we strongly recommend changing the oil before and after the BlueDevil Head Gasket Sealer process. Feel free to contact our tech support team at 888.863.0426 with any questions along the way. What if I already poured blue devil into the reservoir. Will it still work ? You wouldn’t want to add the product in through the reservoir because, as per the directions, you are to add the product to the system when the engine is cold. Water/coolant is only being pulled from the reservoir as needed, so it may not have pulled into the system until the engine was hot. Are you still noticing the same symptoms? Feel free to contact our technical support line at 888-863-0426 if you have any questions. i have a ’99 Eldorado, two months ago I replaced the water pump, a few days ago my radiator was leaking badly, replaced that, today i when and got my oil changed as i was driving along perhaps 45 minutes notice my needle moving forward hot will Blue Devil work on my car? I look forward to your reply…. Once you have had a chance to further diagnose why your vehicle is overheating you will be able to better attack the problem at hand. I used the mechanic approved blue devil head gasket sealer and it worked very well. I only used 16 fl oz per the instructions and still have half the bottle left. A few weeks later i think i may have a small leak again. I would like to use the rest of the bottle for a second treatment, but I don’t feel like doing radiator flush for my system again. Since I already did this flush a few weeks ago is it necessary for me to do this again? Can I just remove my thermostat and add blue devil? Also since i already replaced my thermostat with a brand new one after the first treatment could I re-install this one after the second treatment? Could I also use the pour N go version after having treated with the mechanic approved product the first time? You will still want to flush the system prior to adding a 2nd application to ensure proper results. You will again remove the thermostat for the idling, with BlueDevil, and then you may re-install that thermostat once the idle is complete and the engine has cooled down. If you decide to use the “Pour N Go” then you would not have to flush the system or remove the thermostat prior to use. I have an 1987 ford f150..it has milky oil and white smoke…i have the 16 oz. blue devil sealer. Do i have to remove the thermostar or can i just drain the antifreze and go from there? The 16 ounce BlueDevil “Pour N Go” Head Gasket Sealer does not require you to remove the thermostat; it is an easy-to-use product. You can simply drain enough antifreeze so that you can pour the BlueDevil in. Is this product safe for oil? I have freeze plugs that are leaking, and the geniuses who designed this engine decided to put the freeze plugs in the same chamber as the timing chain where oil is at. Needless to say, there is a relatively low concentration of coolant with the oil, but the oil is leaking because there is a crack in the oil pan. Anyway, will this product seal my freeze plugs if there is hot oil running on the freeze plug all the time, or do I have to do this fix with a DIY solution? The Head Gasket Sealer should never be added to engine oil. Unfortunately, we do not manufacture a product that will help you out in this instance. I have a 2006 Dodge Charger Daytona with the 5.7 Hemi. Is your product safe for that engine? Yes, the BlueDevil is safe to use in your Dodge Charger engine. Feel free to contact us at 888-863-0426 with any further questions. Had someone to put in the blue devil mechanic verson and not sure if they removed the thermostat is it safe to try using it again?? It is very important to follow all directions, including the removal of the thermostat, to ensure best and proper results with the BlueDevil Head Gasket Sealer. Yes, the vehicle needs to idle for a full 50 minutes to use the BlueDevil Pour N Go. The BlueDevil Pour-N-Go Head Gasket Sealer is specifically intended to stop coolant loss. Unfortunately, it will have no effect on burning oil. Can I drive my car immediately after adding blue devil and leTting it idle for 50 minutes? It is best to allow the vehicle to completely cool down (at least 2 hours) before taking it for a drive. Please contact our technical support line at 888-863-0426 so that we can get a better understanding of the vehicle’s condition and be able to make any appropriate recommendations. Hello my name is Tyler, i have a 2005 subaru impreza wrx H4 2.0. when im trying to hit into my boost hard around 4rpm. My car starts to jump, but im pretty sure i know why with that. But my car it running rich, i dont have smoke coming out of the exhuast or a wet drip. But i do have a small bit of coolant in my oil. An my oil cap has a milky look too it. I also keep using oil fast. Could all of this have to do with a head gasket problem???? Or should i say f**k it and buy new trans and motor. Thanks for your question about your WRX. They are great cars and a lot of fun to drive, but they are known to blow head gaskets especially if you drive them hard. Turbo cars in generally use more oil than naturally aspirated cars so your oil consumption might not be unusual. As for the coolant in your oil, that’s a good indication that you have blown head gasket even if you don’t have white smoke from the exhaust. BlueDevil Head Gasket Sealer (available here: http://store.gobdp.com/head-gasket-sealer-38386/) is guaranteed to seal your head gasket leak and get you more life out of your car. 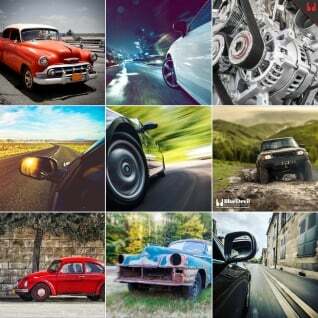 Can i drive so fast (hight rpm) after of the treatment ,? I mean the BD can resist the extreme driving? Thank you for asking about your Subaru Legacy. Once the product seals, it would be a permanent seal. You would be fine to drive the vehicle normally after successful results were achieved. Feel free to contact our technical support line at 888-863-0426 with any other questions. I have 2000 Chrysler Sebring. I was driving and didn’t notice the car overheating untill I got home and notice smoke from the engine and there was no water left in the car. The next morning I put water and started it up and noticed it was losing water. At first I thought it might be the hose underneath but I replaced it and it still leaking water. I have no water in the oil or transmission fluid do u think your product can help my car form leaking the water I’m 80% positive i messed up a head gasket. You’re right, it does sound like you may have a head gasket leak. We recommend using the proper amount of the BlueDevil Head Gasket Sealer to help stop your coolant/water loss. The product can be purchased locally through most auto parts stores such as: AutoZone, Advance Auto Parts, O’Reilly Auto, CarQuest, NAPA, etc. No, it is not a requirement of using the product. You will simply ignore the direction about running your heater on max. My heater core is bypassed, too. I am looking forward to using this on my Dodge Neon. After using blue devil my car stoped shaking it actually runs more smoothly but white smoke still comes out alot i dont know if it worked? Should i try blue devil a second time? Please contact our technical support line at 888-863-0426 so that we can better assist you. The exhaust system may produce smoke for several hours after the BlueDevil process, as it could just be clearing itself out of any residual water vapors or coolant still in the system. It is best if the vehicle is able to idle the full 50 minutes but it is still possible that you may have gotten some benefit during the shorter idle. Feel free to contact us at 888-863-0426 with any questions. Hi. I have a 2002 Honda Civic EX 1.7L that Honda dealership diagnosed with a hairline crack in the head gasket. I used Blue Devil Pour N Go and it seemed to work great… for 2 days… now I’m losing coolant at the back of the engine near the driver’s side door. I’m fairly certain it’s my water pump that Honda actually replaced just 13 months ago (so of course it’s out of warranty by 1 month!). I’m going to have the water pump replaced again tomorrow, my concern is when the mechanic flushes the cooling system will it also remove the Blue Devil from the head gasket effectively putting me right back to square one with the added little bonus of having to fork out $300+ on another water pump? Thank you for asking about your Honda Civic. Once the product seals, it would be a permanent seal. A flush of the cooling system will not undo the seal that was created by the BlueDevil Pour-N-Go Head Gasket Sealer. Feel free to contact our technical support at 888-863-0426 with any other questions. I WAS DRIVING MY 97 TOYOTA PREVIA AND I SMELLED A CHEMICAL COMING FROM SOMEWHERE AND SUDDENLY NOTICED THE TEMP NEEDLE START TO GO UP. RIGHT AWAY I PULLED IN A DRIVE AND LET THE CAR SIT. The coolant may be leaking down due to the cracked block. We recommend adding 1 bottle of the BlueDevil Radiator & Block Sealer (http://store.gobdp.com/radiator-block-sealer-00205/) to help seal the leak. The product can be picked up locally through AutoZone. I Have A 2002 Chevy Impala I Blew My Head Gasket And I Poured In The 16oz Bottle Of Blue Devil Head Gaket Repair And My Car Blew Out White Smoke The First Time i test Drove It And Overheated Still. On The Second Test Drive It Blew Out Very Little White Smoke n Didnt Overheat. But Today I Drove It And Or Drove Just Fine No Overheating Or Nothing. I Drove It To My Sis House And Can Out Like 15mins Later And It Didnt Start For Me. I Wanted To Kno If I Needed To Add Another Can Of BlueDevil Inside ? Thanks for your question about your Chevy Impala. It sounds like BlueDevil Pour-N-Go fixed your head gasket leak as you don’t have the white smoke anymore. Your car not starting may be due to another problem. Since you had a blown head gasket, you may consider changing your engine oil and spark plugs as they oil may be contaminated with coolant and your spark plugs may have gotten fouled by the coolant in the combustion chamber. These problems may also be the reason for your car not starting now. Thanks again for your question! You would need at least 2 bottles of the BlueDevil Pour-N-Go Head Gasket Sealer, as it is only intended for use in 4 or 6 cylinder engines. Feel free to contact our technical support line at 888-863-0426 with any other questions. So I bought Blue Devil 32 oz that requires me to remove my thermostat. I think it would be difficult for me to take out my Mazda 6 2004 and my question is what is the effect if I don’t remove thermostat and use the fluid anyway? Will it work? Will the fluid make any damage to the thermostat? What are the chances that it will go wrong? I believe 32 oz is a lot better than the 16 oz according to my researches from other users but the problem it would cost me more to have a mechanic remove the thermostat. For best results, we strongly recommend removing the thermostat to ensure free flow. The chances of BlueDevil working properly would decrease if all of the directions are not followed exactly, including the removal of your thermostat. You may use either Head Gasket Sealer. The “Pour N Go” (16 oz./white label) is a less concentrated formula that does not require the removal of the thermostat or a flush of the cooling system prior to use. Whereas the “Mechanic Approved” (32 oz./yellow label) requires both the removal of thermostat and a flush before applying the product; the 32 ounce is the more concentrated formula. The product with the yellow label will give you best overall results as long as you can remove the thermostat and flush the system prior to use. However, if the thermostat is difficult to remove or you would rather not then you can always use the “Pour N Go”. With the use of either product, be sure to follow the guidelines for the proper amount to use. Based on your capacity, you will be using 16 ounces either way (if using Pour-N-Go you would need 2 full bottles). The product should be poured directly into the radiator when adding it. Even if the outside temperature is hot we still recommend running your heater on max during the 50 minute idle. Once the 50 minute idle is complete you should shut the engine off and allow it to cool for at least 2 hours. The seal created by BlueDevil is permanent and you should not have to reapply the product at any time. Hi,I have a 2005 dodge grand caravan.I have put a new radiator in it,a new water pump anda new thermostat and it still run hot.Will your product help? Based on your description, it is a little difficult to pinpoint what the issue is. Feel free to contact our technical support line at 888-863-0426 so that we can get a better understanding of the vehicle’s issues and be able to make any appropriate recommendations. Please contact our tech support team at 888-863-0426 so that we can assist you in reapplying the BlueDevil to your Ranger in order that we get the leak completely sealed. We can be reached Monday – Friday, 8:00 AM – 5:00 PM Eastern Standard Time. My mechanic said that my 6 cycl 1993 camry xle had a had a blown head gasket and given the age/mileage of the car, it didn’t make sense to spend the money to replace the head gasket. He suggested junking the car. I bought a bottle of Blue Devil Pour and Go. I followed the instructions on the bottle….The instructions say to slowly pour the Blue Devil into the radiator, (starting with a cold engine)…then turn the heat on full and idle for 50 minutes. I took 2 minutes to pour the BD into the radiator, I turned the heat on full….After 30 minutes the engine temperature instrument showed the engine was HOT so I had to turn off the car. The overflow resevoir was boiling. While the car was idling, it looked like gases were being pumped into the overflow resevoir. Also, I noticed that while the heater was on full, it was not hot. Please provide direction on where I should go from here. I’m on my own, my mechanic went of business last week so I can’t rely on him to help. Thanks for your question about your Camry. There are two possibilities. First, you may not have enough coolant in your system to properly cover the leak or allow your heater to work. We would recommend filling your cooling system all the way up with coolant to make sure your car doesn’t overheat and BlueDevil is properly circulated all the way through your system to seal the leak. If your car cooling system is full and your car still overheats before the 50 minute idling period has passed your head gasket leak may be big enough to require BlueDevil Head gasket Sealer (available here: http://store.gobdp.com/head-gasket-sealer-38386/) which includes a radiator flush and removing your thermostat while you’re sealing the leak. Thank you for asking about your Saturn. It is important that the product be poured directly into the radiator. There is no guarantee that the product would actually pull from your reservoir during that 50 minute idle to actually circulate and be able to seal, which sounds like what happened with your application. If your vehicle only has a reservoir/overflow rather than a radiator cap, instead of pouring BlueDevil through the reservoir/overflow, with the car off and engine cold you should disconnect the top radiator hose and add the product there. Once it has been added reconnect the hose and start the idle from that point. Flushing the cooling system and removing the thermostat, prior to using the product, would also give you an additional benefit. Doing this process in a clean, free-flowing system, will give the product the best chance of circulating correctly and give you the best overall chance of seeing good results. Thank you for your question. After the 50 minute idle, go ahead and shut the vehicle off and let it cool down for a couple of hours (at least 2 hours). At that point, you would be able to take your BMW for a test drive and see the results you got. I have a 2001 VW Jetta, almost a year ago had the water pump replaced (overheating). Still overheated used the pour and go blue devil. Car stopped overheating. Last week had to replace the water pump again. But its still overheating. Since I replaced the water pump do I need to use blue devil again? There are many different things that can cause an engine to overheat. When a vehicle is overheating it doesn’t always mean that it has a blown head gasket. Please contact us at 888-863-0426 so that we may discuss your VW in more detail and give you the best recommendation based on all of its symptoms. I have a 2002 Jeep Grand Cherokee Limited. V8 with a 4.7 cylinder. The thermostat used in my car is what creates the seal from thermostat housing to the engine block, the gasket is built into the thermostat. Without the thermostat in, coolant would leak right through the connecting point. Is there any way to run the head gasket sealant where the thermostat in as long as its open? The way you can get around the thermostat with a housing is by taking the thermostat and modifying it so that the middle piece does not close; you may remove this piece or gut the middle of the thermostat. By doing so you will create a free flow and still be able to have the full housing installed. Once the process is complete you will need to replace the thermostat. You guys have thought of everything. Thanks. Yes, you may use the BlueDevil Head Gasket Sealer with the heater core bypassed; it will still be effective. I used blue devil on my 98 f150 , after the 50 minute idle I test drove right after , wasn’t over heating but will this affect seal? As long as the engine did not overheat then you should be fine. Feel free to contact us at 888-863-0426 with any additional questions. Yes, the BlueDevil Pour-N-Go Head Gasket Sealer is safe to use on your Toyota Supra. Feel free to contact our technical support line at 888-863-0426 with any other questions. Is there a need for oil change if you only use the pour n go ? Thank you for your question. If you have water/coolant in the oil, you would want to change the oil before and after the BlueDevil process, regardless of whether you are using the Head Gasket Sealer (32 oz yellow label) or the Pour-N-Go Head Gasket Sealer. Operating your vehicle with water/coolant in the motor oil for extended periods of time can and will cause further damage to the engine. Feel free to contact our technical support line at 888-863-0426 with any other questions. HI I purchased the pour n go blue devil head gasket sealer…my jeep overheated before the 50 min idle had elapsed..east gasses pushed out into the overflow. If it starts overheating should it be shut down and wait till cool and then continue with the rest of the 50min or let it idle for the full 50 min?? If the vehicle begins to overheat within the 50 minute idle you would want to shut it down to prevent harm to the engine. You had mentioned that the vehicle may be getting combustion/exhaust gases blowing into the cooling system and creating pressure. To give yourself the best overall chance of BlueDevil working successfully, in addition to the directions, you should remove the spark plug from the cylinder with the leak; this will be the spark plug from the cylinder with the low compression reading. If you are not sure which one that is, you may pull all of the spark plugs and will notice one will have a white-crystal-like substance on it and/or may look dirty; this is the plug you should pull. Leave that plug out for the 50 minute idle in order to relieve the pressure from building up and thus allowing the product to seal properly. Be sure to follow the guidelines for the proper amount to use based on the size of your cooling capacity. That makes sense but have you ever heard an engine run without a sparkplug in a cylinder? It sounds like the engine is going to rip itself apart. I shut my jeep off and let it cool down then I fired her up again and left it idle for about another 15-20 started to heat up. Shut it down…was nervous but heck it didn’t climb above the 2 in 210 on my way home wich is a little over a half an hr drive. So fingers crossed. Going to test it again today. My 2005 ford explorer lost coolant, I’m going to use the Pour “n Go Head Gasket Sealer, changing engine oil and spark plugs. My question is: What should I do first? Thank you for asking about your Ford Explorer. If you have water/coolant in the oil, we would recommend changing the oil first before starting the BlueDevil process. You would also want to do a second oil change after the process was complete, as the product would not instantaneously seal and you would still get a little water/coolant in the oil during the 50 minute idle. Feel free to contact our technical support line at 888-863-0426 with any other questions. Wondering does the product weaken ?? Will//should I do every so often?? Anything will be better than the 3000 dollar head gasket job from Cadillac! !!! Or the much more new engine!! You only need to apply BlueDevil Head Gasket Sealer 1 time; it creates a permanent seal. We are very happy to hear the product worked out for your Cadillac! Yes, we still recommend using BlueDevil Head Gasket Sealer for your Ford. It sounds like the vehicle may be getting combustion/exhaust gases blowing into the cooling system and creating pressure. To give yourself the best overall chance of BlueDevil working successfully, in addition to the directions, you should remove the spark plug from the cylinder with the leak; this will be the spark plug from the cylinder with the low compression reading. If you are not sure which one that is, you may pull all of the spark plugs and will notice one will have a white-crystal-like substance on it and/or may look dirty; this is the plug you should pull. Leave that plug out for the 50 minute idle in order to relieve the pressure from building up and thus allowing the product to seal properly. Be sure to follow the guidelines for the proper amount to use based on the size of your cooling capacity; you will only need 16 ounces. Due to your vehicle only having a reservoir/overflow rather than a radiator cap, instead of pouring BlueDevil through the reservoir/overflow, with the car off and engine cold you should disconnect the top radiator hose and add the product there. Once it has been added reconnect the hose and start the idle from that point. Do you have to remove the thermostat? My issue is on my 03 cadillac cts. theres many parts to take off to get to the t stat. If you have an issue with removing the thermostat, you can use the BlueDevil Pour-N-Go Head Gasket Sealer, which has a slightly less concentrated formula than the Head Gasket Sealer (32oz yellow label) and would not require the removal of the thermostat. Keep in mind, you would need 2 bottles of the Pour-N-Go Head Gasket Sealer for your V-8 Northstar engine. Feel free to contact our technical support team with any other questions. Is there any continuing sealing benefit from the Pour N Go remaining in the system, or does it’s leak sealing properties stop after the initial 50 minute idle and 2 hour cure cycle? The product only reacts to heat one time, so after a complete heat cycle (heat up and cool down) it is no longer active. The product is only sealing during the initial 50 minute idle. After the vehicle cools, any extra BlueDevil in the system would be like water, it’s not going to continue to react or continue to seal. I have spent the better part of six months tracing an intermittent leak in my 1.6L 16v Suzuki Sidekick to include UV dye, pressurized leak tests, and replacing the water pump and head gasket all with no luck. This lead me to believe I was looking at a crack or warping. I tried the Pour and Go as a last ditch attempt… and although it only been a week, I have not lost a drop of antifreeze yet! Usually I would be ~ 1-2 cups low. so I have a blown head gasket on my 94 Z28 & followed the pour n go directions to a T, but about 5minutes into the 50min idle it wanted to overheat and would shut off.. what do I do?!!!?? Based on your description, unfortunately, the leak you have or symptoms you are having may be a little too extreme for what the product is intended for. In order to get the full benefit of the product, the vehicle would need to be able to idle for a full 50 minutes without overheating or stalling out, and you shouldn’t be losing more than about a quart of water/coolant. A hard part repair may be your best option. Please contact our claims department at 888-863-0426 so that we may assist you in filing for the warranty on the product. I have Marne Inboard diesel, closed coolant system cooled by a tubed heat exchanger. I’m losing coolant and have a lot of white smoke in the exhaust but only at mid to high rpm. I changed head gasket and had head checked by machine shop but still same white smoke and loss of coolant . Trying blue devil but concerned runs cold at idle with no thermostat and coolant only leaks into exhaust at higher rpm. Is it important to only run for 50 minutes and no longer ? Can I run on load at high rpm ? Even on along run under power without thermostat barely reached 150 ‘. Should I replace thermostat but not use antifreeze to allow longer time for blue devil to find and seal the leak? Thank you for asking about your Marine Inboard Diesel. Based on your description, we recommend using the BlueDevil Pour-N-Go Head Gasket Sealer. The product will react at a temperature of about 150 degrees Fahrenheit. If you are noticing it is not really getting up to that temperature during the 50 minute idle, you can slightly increase the rpm and/or let it idle for longer than the 50 minutes required. 50 minutes is the minimum the engine would need to run in order to achieve proper results. Feel free to contact our technical support line at 888-863-0426 with any other questions. Hi, I have a ’03 Durango with a 5.9. Can I use the pour and go? or do I need to use the more concentrated bottle. I’ve blowned three radiator. And Coded the number 7 is Misfiring. Due to the capacity of your cooling system we recommend using the 32 ounce BlueDevil Head Gasket Sealer (http://store.gobdp.com/head-gasket-sealer-38386/). It sounds like the vehicle is getting combustion/exhaust gases blowing into the cooling system and creating pressure. To give yourself the best overall chance of BlueDevil working successfully, in addition to the directions, you should remove the spark plug from the cylinder with the leak (possibly #7); this will be the spark plug from the cylinder with the low compression reading. If you are not sure which one that is, you may pull all of the spark plugs and will notice one will have a white-crystal-like substance on it and/or may look dirty; this is the plug you should pull. Leave that plug out for the 50 minute idle in order to relieve the pressure from building up and thus allowing the product to seal properly. Be sure to follow the guidelines for the proper amount to use based on the size of your cooling system; you will need the full 32 ounce bottle for your Durango. I have a 2004 Ford Xscape and it want start… Can I use blue devil with out it running??? What can i do??? In order to get the benefit of the product, the vehicle would need to be able to maintain idle for a full 50 minutes. Unfortunately, a hard part repair may be your best option. Thank you for asking about your Lincoln Towncar. Based on your description, we recommend using the BlueDevil Head Gasket Sealer http://store.gobdp.com/head-gasket-sealer-38386/. The Head Gasket Sealer (32 oz. yellow label) would be more appropriate for your V8, as the Pout-N-Go Head Gasket Sealer is intended for use in 4-6 cylinder engines. Feel free to contact our technical support line at 888-863-0426 with any other questions. We used one bottle of the pour and go in our 04 dodge dakota with a v8. The 50 minute idle time is almost up. We just saw we should have used 2. Should we do it again? You would need at least 32 oz. of the product at one time to properly treat your Dodge Dakota. The product only reacts to heat once, so any extra BlueDevil in the system would be like extra water. It will not continue to react or continue to seal. Please contact our technical support line at 888-863-0426 for assistance in this matter. Thank you for asking about your Lincoln Continental. The BlueDevil Pour-N-Go Head Gasket Sealer is intended for use in 4 or 6 cylinder engines. You would have need 2 bottles for your V8. Please contact our technical support line at 888-863-0426 so that we can get a better understanding of the vehicle’s condition and be able to make any appropriate recommendations. Hi, I have a leak in an honda accord 2000, i buy blue devil pour n go, but i have seen in videos where the instructions are different, they recommend removing the thermostat and doing a flushing on the system, and in the instructions of pour n go is only pour in the system, It is necessary to do that, remove the thermostat and do a flushing or not? The BlueDevil Pour-N-Go Head Gasket Sealer does not require the removal of the thermostat or cooling system flush prior to using the product. It sounds like you may have been looking at directions for our 32 oz. yellow label Head Gasket Sealer, which has a slightly higher concentrated formula and would require those steps. I have a 2003 dodge durango 5.9 V8 can i use blue devil on this size engine? Thank you for asking about your Dodge Durango. You may use either Head Gasket Sealer. The “Pour N Go” (http://store.gobdp.com/pour-n-go-head-gasket-sealer-00209/) is a less concentrated formula that does not require the removal of the thermostat or a flush of the cooling system prior to use. Whereas the “Mechanic Approved” (http://store.gobdp.com/head-gasket-sealer-38386/) requires both the removal of thermostat and a flush before applying the product; the 32 ounce is the more concentrated formula. The product with the yellow label will give you best overall results as long as you can remove the thermostat and flush the system prior to use. However, if the thermostat is difficult to remove or you would rather not then you can always use the “Pour N Go”. With the use of either product, be sure to follow the guidelines for the proper amount to use. You will need two Pour-N-Go Bottles to properly treat your Dodge. I used the Yellow Label Head Gasket Sealer 32oz on my 2004 Dodge Ram 4.7L V8 about 2 years ago. The product worked great up until 6 months ago. I started getting rough starts and misfire codes on cylinders 1, 3, and 5 and am getting bubbles in my coolant. So I redid the whole process as I did before. I removed my thermostat, flushed system with water, then used 2x containers of Bluedevil Flush. Drove truck around for a couple days to get it super clean. Drained, flushed with water again and did the Bluedevil Yellow Label with 50 minute idle just as before. Unfortunately I don’t believe it completely sealed those cylinders because I am still getting bubbles on my system. Now I read on some of your other comments that I should remove the spark plug from the cylinder with this type of problem to eliminate the pressure. I didn’t do this as I have 3 cylinders leaking. My truck, during the 50 minute idle, never got above 105 degrees F. The bluedevil and distilled water mixture is still in my system. Since my truck didn’t get all the way warmed up, could the bluedevil in my system still be good and able to seal my leaks if I remove says 1 spark plug at a time and idle for about 20 minutes on each cylinder with the plugs removed? Sorry for the long message. I am just looking to avoid changing the head gasket until spring time here in NY. I appreciate your prompt reply as I have to get antifreeze back into my system today. It will be falling below freezing temperatures by tonight. Thank you. Thank you for asking about your Dodge Ram and for all of the detail you have provided. Based on your description, we would recommend having a compression test performed. Which ever cylinder is reading with the lowest pressure, that is the plug you would want to pull and leave our for the entire 50 minute idle. The product will react at a temperature of around 150 degrees Fahrenheit, so it does not sound like the product has reacted yet, being that the temperature only got to around 105 degrees Fahrenheit. During the 50 minute idle, in addition to the directions and spark plug removal, you may want to rev the engine up a bit during the idle to ensure it can get up to temperature. Feel free to contact us at 888-863-0426 with any other questions. does this product work for semi trucks? The BlueDevil Pour-N-Go Head Gasket Sealer is intended for use in 4 or 6 cylinder engines. The more appropriate product to use for your semi truck would be the BlueDevil Head Gasket Sealer (http://store.gobdp.com/head-gasket-sealer-38386/). Do you happen to know what the cooling system capacity is on the vehicle? On the back of the bottle, you will see a cooling system capacity table, which would show you how much of the product you would need. Feel free to contact our technical support line at 888-863-0426 with any other questions. What kind of vehicle did you use the product in? Please contact our technical support line at 888-863-0426 so that we can get a better understanding of the vehicle’s condition and be able to make any appropriate recommendations. I have a Chevy small block 350 that I recently poured bars leak, I’m not sure that the product is working as it should I understand it’s all a gamble. But seen your reviews and I’m curious to try it out, would I need to flush my coolant to pour blue devil? Thank you for asking about your Chevy. Based on your description, you would want to flush the cooling system prior to adding BlueDevil. The BlueDevil Pour-N-Go is intended for use in 4-6 cylinder engines. Please contact our technical support line at 888-863-0426 so that we may get a better understanding of the vehicle’s condition and be able to make any appropriate recommendations. I have a 3.4 V-6 4Runner with 217,000 miles. In the past year when starting up on a cold engine it has a rough idle, on occasion it will blow out a lot of white steam until it is warm (it isn’t normal for this part of the country). It uses some antifreeze also but not much. When it warms up and the thermostat opens up I have no more problems until next time I start it when cold. I am leaking antifreeze into the exhaust and I think this is why it idles rough, just not enough to make steam. Sometimes it leaks more and a lot of steam. Would this BlueDevil Head Gasket Sealer help? (Also, I have checked and changed MAF, O2, vacuum lines, fuel injectors, coil packs, etc so this is the last thing I have to check. Thank you for asking about your Toyota 4-Runner. Based on your description, you would be a great candidate for the BlueDevil Pour-N-Go Head Gasket Sealer. It is possible that you are getting combustion/exhaust gases pumping back into the cooling system. You can use a “Block Dye Tester” to confirm whether or not that is the case. BlueDevil will still work if your vehicle is getting combustion/exhaust gases blowing into the cooling system and creating pressure. To give yourself the best overall chance of BlueDevil working successfully, in addition to the directions, you should remove the spark plug from the cylinder with the leak; this will be the spark plug from the cylinder with the low compression reading. If you are not sure which one that is, you may pull all of the spark plugs and will notice one will have a white-crystal-like substance on it and/or may look dirty; this is the plug you should pull. Leave that plug out for the 50 minute idle in order to relieve the pressure from building up and thus allowing the product to seal properly. Ok, I tried this a few weeks ago, followed instructions and also pulled #3 sparkplug, let run for 50 minutes, sounded horrible as expected with a plug missing. Afterwards I put sparkplug back in, new thermostat, and antifreeze. I have been driving it and no more problem, works great as of now! Looks like this problem is resolved. THANK YOU BLUEDEVIL! That is excellent to hear! Once the product seals it would be a permanent seal, so you should be good to go at this point. We appreciate your wonderful feedback! Hi, I have a 2003 Honda civic. I’m going to try the pour-n-go. My question is.. do you have to leave the heater on max after pouring the product and leaving the heater on max while doing the 50mins idle? The heater should remain on the maximum setting during the entire 50 minute idle. Thank you for asking about your Jeep Liberty. If your vehicle only has a reservoir/overflow rather than a radiator cap, instead of pouring BlueDevil through the reservoir/overflow, with the car off and engine cold you should disconnect the top radiator hose and add the product there; do not pour it into the reservoir. Once it has been added reconnect the hose and start the idle from that point. Based on your description, It sounds like you may be getting combustion/exhaust gases blowing into the cooling system and creating pressure. We recommend applying BlueDevil Head Gasket Sealer to remedy the problem. To give yourself the best overall chance of BlueDevil working successfully is to remove the spark plug from the cylinder with the leak; this will be the spark plug from the cylinder with the low compression reading. If you are not sure which one that is, you may pull all of the spark plugs and will notice one will have a white-crystal-like substance on it and/or may look dirty; this is the plug you should pull. Leave the plug out for the 50 minute idle in order to relieve the pressure from building up and thus allowing the product to seal properly. As per the directions, you will be removing the thermostat and flushing the cooling system prior to product use. Feel free to contact our technical support team at 888-863-0426 with any other questions. I have a 2001 Pontiac Montana, I orderd the 32 OZ bluedevil from ebay. I have had occasional overheating for about a year. I couls not find a leak so I figured it was some sort of head gasket problem. I was drivibg on the highway and the Van got really hot. I oushed it into the red trying to get off the highway. SInce then when I first reloaded the coolant at a 7-Eleven after the overheat I still have clean oil. One trip to town and back again it over heated. Now I have slight white smoke and my oil is contaminated looks like chocolate milk. My question is, that you recoment pulling the thermostat but in this model that can not be done without pulling the throttle body off. A good bit of work and a new gasket is required. Once you get to the thermostat the gaslet is a rupper O-Ring on the thermostat so there is no gasket to seal it if you remove the thermostat. Also I feel I would have to ad water while I try to run the car for 50 minutes and the reservoir does not seem to draw the fluid in. The system does not bleed so I know I am getting air into the coolant. What do advise me about the problems I am seeing in using this product? Thank you for asking about your Pontiac Montana. If removing the thermostat would be an issue for you, we recommend using the BlueDevil Pour-N-Go Head Gasket Sealer (http://store.gobdp.com/pour-n-go-head-gasket-sealer-00209/). The product is an easy, do it yourself version of our 32 oz. bottle and does not require the removal of the thermostat. The product is intended for use in 4 or 6 cylinder engines, so be sure to use the proper amount of the product. You would not be able to add any water/coolant during the 50 minute idle. The system should be almost at capacity before starting the process, leaving just enough room for the recommended amount of the product. In order to get the benefit of using the product, the vehicle would need to be able to idle for a full 50 minutes without overheating or stalling out, and you shouldn’t be losing more than about a quart of water/coolant during that 50 minutes. Feel free to contact our technical support line at 888-863-0426 with any other questions. I was having problems with my 2004 Nissan Altima. A trusted mechanic worked on my car and the last thing he did was pour the BlueDevil Radiator and Block Sealer. He followed the directions and even let the car sit over night. Flushed everything out and did a oil change. Car runs fine, but now there is quite a bit of white smoke coming out of the exhaust. could that be due to the car smoking out the BlueDevil ? Thank you for asking about your Nissan Altima. What were the symptoms the mechanic was originally trying to treat? The BlueDevil Radiator & Block Sealer is specifically formulated for seeping or lightly dripping leaks from the radiator and/or the block. Please contact our technical support line at 888-863-0426 so that we can get a better understanding of the vehicle’s condition and be able to make any appropriate recommendations. I have a 2000 Cadillac DeVille I just put brand new radiator thermostat and water pump in it just find out my head gasket is about to go. I used the pour and go and put it in the reservoir since I don’t know where the radiator hoes was my car is know for running hot so after 20 minutes if idol it turned off should I let it cool off than idol more? Did i just waste my money putting it into the reservoir? Thank you for asking about your Cadillac Deville. The BlueDevil Pour-N-Go Head Gasket Sealer (https://store.gobdp.com/pour-n-go-head-gasket-sealer-00209/) is intended for use in 4 or 6 cylinder engines, so it would not have been enough product to properly treat your Northstar V-8. Also, it is very important that the product be poured directly into the cooling system, and not through a reservoir/overflow tank. Water/coolant does not pull from the reservoir/overflow right away, in fact, it probably is not pulling until the engine is hot, which would essentially be like adding the product when the engine is hot. Please contact our technical support line at 888-863-0426 for further assistance. I have a land rover 2001, doesnt have a radiator cap, should i pour it by the top hose that goes straight to the engine? Thank you for asking about your Land Rover. Yes, that would be acceptable. If your vehicle only has a reservoir/overflow rather than a radiator cap, instead of pouring BlueDevil through the reservoir/overflow, with the car off and engine cold you should disconnect the top radiator hose and add the product there; do not pour it into the reservoir. It may be added into the hose or the opening on the radiator. Once BlueDevil has been added, reconnect the hose and start the idle from that point. Yes, the BlueDevil Head Gasket Sealer (https://store.gobdp.com/head-gasket-sealer-38386/) is safe and compatible to use on your W124 Mercedes Diesel, and would be the intended product to seal a leaking freeze plug. I have a 92 C2500 with a 350 small block the head gasket on bank 2 is blown I can visually see the leak and white smoke from the rear now I know this is recommended for 4 or 6 cylinder but can this work on mine as well or is there different quantity or something I need to use? You may use either Head Gasket Sealer to retreat the vehicle. The “Pour N Go” (http://store.gobdp.com/pour-n-go-head-gasket-sealer-00209/) is a less concentrated formula that does not require the removal of the thermostat or a flush of the cooling system prior to use. Whereas the “Mechanic Approved” (http://store.gobdp.com/head-gasket-sealer-38386/) requires both the removal of thermostat and a flush before applying the product; the 32 ounce is the more concentrated formula. The product with the yellow label will give you best overall results as long as you can remove the thermostat and flush the system prior to use. However, if the thermostat is difficult to remove or you would rather not then you can still use the “Pour N Go”. With the use of either product, be sure to follow the guidelines for the proper amount to use. Based on your capacity, you will be using 32 ounces either way. I have a 2004 Volvo S60 2.5t, 5 cylinder. I haven’t noticed coolant consumption, there is no oil in thecoolant, and there is no coolant in the oil. There is no white smoke from the exhaust, but the odor of burnt coolant is very strong in the exhaust stream when the car is idling. I am a certified mechanic, so I have already checked into everything else, and I eliminated the possibility of a cracked sleeve in one of the cylinders. What I want to know is if this product can be used in a turbocharged vehicle with a water cooled turbo. I just replaced the turbo a couple months ago, and I don’t want to risk fouling it up with a sealant. Also, I am not made of money, so I wanna try a solid bandaid fix to confirm my suspicions of a small leak in the head gasket. I will eventually tear the engine down and rebuild a lot of the internal components since I am at nearly 220,000 miles on this engine. Thank you for asking about your Volvo S60. Yes, the BlueDevil Pour-N-Go Head Gasket Sealer is safe and compatible to use in turbocharged vehicle with a water cooled turbo, however, it would not be appropriate to use if you are not noticing a loss of water/coolant. Unfortunately, it should not be used as a preventative measure/maintenance. Based on your description, we would not recommend using the product at this point. I have a 2003 chevy venture can I use the pour and go? Yes, you should apply 1 bottle of BlueDevil Pour N Go Head Gasket Sealer to treat your Chevy Venture. The product is safe and compatible to use in your vehicle. Hi, I have a 2004 Cadillac srx that has either a cracked or blown head gasket. Can I use BlueDevil Pour and Go?? Will it fix the problem, or does someone have to repair on it manually? Thank you for asking about your Cadillac SRX. You may use either Head Gasket Sealer to treat your vehicle. The “Pour N Go” (http://store.gobdp.com/pour-n-go-head-gasket-sealer-00209/) is a less concentrated formula that does not require the removal of the thermostat or a flush of the cooling system prior to use. Whereas the “Mechanic Approved” (http://store.gobdp.com/head-gasket-sealer-38386/) requires both the removal of thermostat and a flush before applying the product; the 32 ounce is the more concentrated formula. The product with the yellow label will give you best overall results as long as you can remove the thermostat and flush the system prior to use. However, if the thermostat is difficult to remove or you would rather not then you can still use the “Pour N Go”. With the use of either product, be sure to follow the guidelines for the proper amount to use. Just wanted to say, holy crap! I have a 1998 pontiac montana that was losing water from the top of the coolant reservoir due to exhaust in the coolant, alternating with misfires and thick white exhaust. I followed the directions and within 20 minutes the misfires stopped and the exhaust is no longer forcing all the water out of the reservoir… And my heat works again, just in time for a Michigan winter. Thank you! We are excited to hear the results you’ve gotten on your Pontiac Montana. Once the product seals, it would be a permanent seal, so you should be good to go at this point. Thank you for your positive feedback. Hello. I am not mechanically inclined and I stumbled upon pour n go head gasket sealant when searching symptoms of cracked head gasket. I attempted to pour the fluid in through the bottom radiator hose but it seemed to not accept it, so I poured it into the reservoir. I understand this can be less effective. I failed to run the heater through the idle phase, is it possible I will still have some success or should I redo the process? Thanks in advance. Adding the product in through the radiator would limit it’s effectiveness. Are you still noticing a loss of water/coolant? Please contact our technical support line at 888-863-0426 so that we can get a little better understanding of the vehicle’s condition and be able to make any appropriate recommendations. How long do I wait to change the oil after using the pour and go? You may change the oil after the 50 minute idle is completed and the vehicle cools back down. If you were getting water/coolant into the oil, we recommend changing the oil before and after the BlueDevil procedure. My 2013 prius v does not have a radiator cap and I can locate the upper hose to the radiator. Can I pour the BD head gasket sealer into the coolant reservoir and get same results? Thank you for asking about your Toyota Prius. If your vehicle only has a reservoir/overflow rather than a radiator cap, instead of pouring BlueDevil through the reservoir/overflow, with the car off and engine cold you should disconnect the top radiator hose and add the product there; do not pour it into the reservoir. It may be added into the hose or the opening on the radiator. Once BlueDevil has been added, reconnect the hose and start the idle from that point. BlueDevil Oil Stop Leak — What is my Car Leaking?